Caris LeVert defined the first dozen games of the Nets' season, bookending it with a game-winning layup against the Knicks and a miracle floater to beat the Nuggets. After LeVert's injury, Spencer Dinwiddie took the spotlight. He earned an extension to the delight of many fans and set a career-high with 39 points. But neither LeVert nor Dinwiddie will be representing Brooklyn at the All-Star Game later this month. 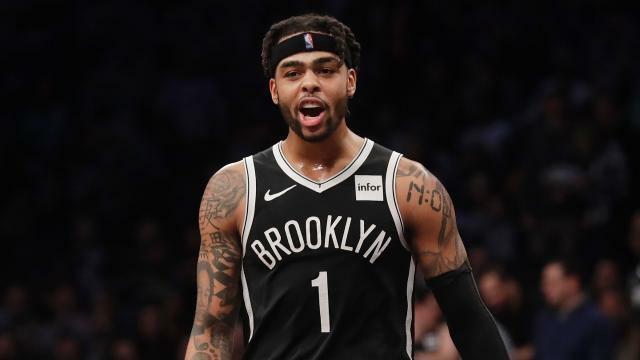 That honor belongs to D'Angelo Russell, the 22-year-old point guard leading the Nets into playoff position with fewer than 30 games to play. When Russell plays in the NBA's midseason showcase, it'll be his first All-Star appearance. This was far from an inevitable coronation. After going No. 2 overall to the Lakers in the 2015 NBA Draft, Russell was traded to the Nets two years later as part of a salary dump, the nadir for a top point guard prospect. Now, Russell is undoubtably living up to the billing of his draft pedigree. He struggled to find his footing during an injury-plagued first season in Brooklyn before catching lightning in a bottle this season. He's already played in more games in 2018-19 than all of last season while playing more minutes a game. In light of the other fellow guards' injuries, the Nets have needed Russell's durability. Not only has Russell stayed on the court, he's been dynamic once there. He's posted career-bests with 19.6 points, 6.4 assists and 1.2 steals per game while improving his 3-point, free throw and overall field goal percentages. His true-shooting percentage is up to 53.5 from 50.9 percent in 2017-18. Posting a nearly identical usage rate from a year ago, he's posted his lowest career turnover rate while boosting his assist rate. The 6-foot-5 point guard has turned his game to another level in the new year. Four of his nine 30-point efforts have come in 2019, including a 40-point tour-de-force in Orlando that culminated with a game-winning 3-pointer with 27 seconds to go. Since Jan. 1, the Nets have an offensive rating of 111 and defensive rating of 102.1 with Russell on the court for a team-leading 8.9 net rating. That's 17th in all of basketball during that span, just behind fellow All-Stars Joel Embiid and Nikola Jokic. Russell is criticized as a volume scorer, the type of player who puts up stats merely because he's the one with the ball. While he may have been that in the past, he's improved his efficiency to evolve into a more valuable player this season. His off-the-dribble three has been lethal and game-changing. Going from 32.4 percent to 37.4 percent from 3-point range may not seem like a huge jump, but 35 percent is league average. Therefore, Russell reamins highly effective shooting upwards of seven treys a game while doing so in Kenny Atkinson's system. Staying within the system, within the moment, has been Russell's largest leap this season and it's one that's the natural next step for a talented youngster. There were times last season, particularly in a March loss in Sacramento, where he was caught trying to do too much. Those moments are few and far between this season. It's cliche, but he's making the right passes and shooting the right kind of shots. Alhough he only turns 23 on Feb. 23, Russell plays in a style befitting a fourth-year player. His maturity is on display all season more in what he doesn't do than what he does. Instead of sulking after riding the bench during crunch time, he remains his teammates' biggest fan. The best example was how he stayed engaged as Dinwiddie nearly single-handedly beat the Rockets in an overtime classic in January. He took a late benching against the Celtics a week later in stride and followed up with 30 points versus the Bulls. The gifted guard can still improve his game. He can still cut down on turnovers, and he needs to be more consistent defensively. The Nets need Russell more than ever with LeVert and Dinwiddie shelved in the short term. When adversity has hit Brooklyn this season, Russell has lived up to the challenge. A restricted free agent when the season ends, Russell continues to put himself in position for a rightful payday. For now, Russell has a lot on his plate as he spearheads the Nets' pursuit of a postseason berth. However, in a fortnight, that playoff pursuit will take a brief pause as he shows off his talent in Charlotte for a well deserved first All-Star Game.